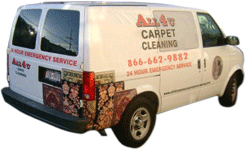 Novato All 4 U Carpet Clean offers the best in commercial carpet cleaning service and commercial upholstery cleaning service. We are experienced, equipped, and capable of providing our services to businesses with areas of 10,000 square feet or more. We service the carpets and upholstery of restaurants, hotels, office buildings, schools, universities, and retail spaces. Novato All 4 U Carpet Clean possesses the equipment to handle the cleaning of high-traffic areas and will thoroughly remove the stains of any high-volume business. We will accommodate our clients busy working schedules to ensure that our work is done at the most convenient time. Our reliable and efficient technicians can accomplish the maximum amount of carpet cleaning service in a given period of time. We offer free estimates, licensed, and insured, so call today to schedule an appointment.